My trusted partner, Steffi Lewis is the business blogging expert! Experts are there to assist you with all aspects of your business. Don’t want to do something? Can’t do something? Haven’t got the time to learn how? Working with an expert (in my case I call them my ‘trusted partners’) means you can delegate any aspect of your business that isn’t a core skill. I’ve followed Steffi for years and watched with admiration as she went through a major, life-threatening illness, but was able to keep her business going through all of it. Knowing she was back to full strength again, I wanted to meet this inspirational entrepreneur and following a number of conversations, we agreed to work together. Steffi is the business blogging expert. Day in, day out, she creates finished, polished blog posts for her clients and has extra plug-in services that extend what she can do. The most amazing thing is that she developed the technology to do all this herself! 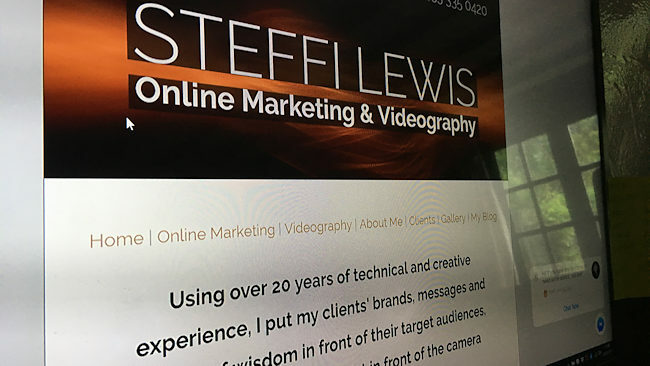 There’s no WordPress or MailChimp here … it’s all pure Steffi Lewis, and it works. The process of building a blog post for one of my clients is quite in depth. From the moment they submit their ‘raw thoughts’ to the instant it is published, what actually happens within my editorial system? I check the spelling and ensure the grammar is perfect. Remember that human beings will be reading this and there are many ways to make the words flow correctly, ensuring it is readable from start to finish. I sometimes need to add the odd sentence or paragraph if the client hasn’t submitted enough, but they’ll always ensure it is in the spirit of the original raw thoughts and flows correctly within the overall text. Occasionally we’ll need to delete text. This happens when the original raw thoughts have a ‘split focus’ and will go with the strongest of the two, building the blog post around that and removing the weaker one. Blog posts are always about something specific so using my built-in analysis tools, I can get the system to suggest a range of keyphrases for Google. I grab one with low competition, but high search rates and fit it into the text so that Google includes the blog post in search results for that specific phrase. This sometimes means a rewrite of part of the text to make the keyphrase fit. I believe it is very important to make a blog post interesting for the widest possible audience. Different people learn and understand in different ways so I sometimes modify the text to accommodate them. Neuro-Linguistic Programming (NLP) tells us that there are four primary ‘internal representations’. These are Auditory Digital (thinking), Visual (seeing), Auditory Tonal (hearing) and Kinaesthetic (feeling). I know the internal representation system of our clients (I just look at the raw thoughts and my analysis tools show me the verb usage), then I can modify these ‘predicates’ so there is more of a balance between all four of these major internal representation systems. Blogs and web pages are very different. Most websites talk about a company so use ‘we’, ‘us’ and ‘our’ a lot. But blog posts fall into one of two categories – either an ‘inward’ post that uses ‘I’ or an ‘outward’ post that uses ‘you’. My analysis tools give me the balance between I, we and you then I decide if it’s going to be a personal post (about the authors own experiences) or a helpful post (giving the reader a nugget of useful information they can use in their own life) and change the wording accordingly. By the time I’ve edited the text and applied the previous four processes to it, I have a pretty good idea of the perfect image to go with it and what the caption should be (Google image search uses the caption so it makes sense to have one). I have access to over 19 million images and usually find exactly what I’m looking for. A blog post must have an image to go with it and I’ll always find the perfect one. Oh, and I don’t charge extra to license these images … they’re included in the monthly subscription. I’ve taken a long time to develop my analysis tools and I use them every day to produce the perfect blog posts for my clients. When you read any of my clients’ work then you’ll always find them engaging, informative and useful. Yes, you can do this yourself each week by creating your own blog and spending hours writing then editing then finding the perfect image, but I do that for my clients – day in and day out – and have polished the process so well that it takes me less than an hour from the original “I’m editing your submission” email to the “your blog post is ready for your approval” email where I include the permalink for you to review. Editing for spelling and grammar, editing for keyphrases, editing for NLP linguistics, checking the I/we/you usage, choosing the perfect image … it takes time to create the perfect blog post. Whilst coaching and mentoring the business owners I work with, we take a considerable amount of time considering their ‘positioning’ which is the 4P Business Development “P” for branding, marketing, promotion and advertising. When you want to include a blog as part of your marketing strategy it is absolutely crucial that you get it right, which is why I’m pleased to feature Steffi Lewis here this week. If you’d like to find out more about business blogging and how Steffi can help you then do visit www.steffilewis.com or to talk about positioning your business and learning how to delegate, give me a call on 01280 700405 or click here to ping me an email and let’s see how I can help you.